My intention in this paper is to examine the development of the MPLA (Popular Movement for the Liberation of Angola), the most 'left-wing' of the three major national-liberation movements which arose in Angola during the colonial period, and the movement which was finally successful in establishing itself as the Government of an 'independent' Angola. I have produced this case-study of a national-liberation movement, because I am interested in the wider question of anti-imperialist struggle, and in developing a libertarian perspective upon it. By studying the ideological roots of MPLA, and the effect of these roots upon the movement's tactics and organisational structure, I hope to clarify some central features of the whole question of national-liberation in the "Third World". I do not believe in the possibility of 'objective' or 'value-free' social analysis: such a notion is itself a product of, and ideological prop for, the liberal status quo. Every social analysis is, of necessity, prejudiced, and this can be constructive and refreshing so long as the writer makes clear the nature of her/his bias. In my case, I am writing as an anarchist who, while welcoming struggles against imperialism in the Third World, feel that the authoritarian character of many national-liberation movements should give us cause for reflection. The paper is divided into three sections. In the first, the outline of MPLA's historical development is revealed and discussed, more or less chronologically. The second section attempts to gain an analytical understanding of this development, tries to find a logic behind the mere formless sequence of events. This attempt focuses upon certain assumptions and contradictions which, from the start, were manifested in MPLA's ideology, tactics and organisational structure. Finally, in the third section I try to suggest a few ideas towards a libertarian perspective on anti-imperialist struggle. My emphasis is therefore upon the internal dynamic of the movement's development; to that extent, this is not a complete or rounded study. It has been suggested that I should have discussed the Angolan economy and its place in the imperialist nexus, or that I should have concentrated upon MPLA as a pawn in superpower imperialist rivalries. These topics are important, and crucial if we are aiming at a 'full' understanding of the situation. But I have chosen to concentrate upon the national-liberation movement itself, because we are so frequently told that the only way we can support anti-imperialist struggles is by supporting these movements. And they are so far away that we often afford ourselves the luxury of being totally uncritical of them. But our sympathies should surely lie not with any political movement, but with the vast suffering masses of the underdeveloped world. Some movements arise from the masses and consistently embody their aspirations, while others are created and maintained by elites. Into which category does MPLA fall? I have divided the history of MPLA, from its foundation in 1956 up to the end of the Angolan civil war in 1976, into three periods: the first, a period of 'Early militancy'; the second, a period of 'Exile'; and the third, a period of 'Armed struggle'. However, it will emerge that certain sustained themes run right through this twenty-year span. Portuguese colonialism differed crucially from the British variety in its altitude to native populations: it was at once more oppressive and more enlightened. Thus in Angola, traditional African communities were progressively destroyed from the 1930s onwards, and the African population was driven in hordes to the towns. More than one-third of the African population was forced into urban life in this way, mostly living in abominable shanty-towns. Meanwhile, the British were preserving the peace (and their profits) by means of their, perhaps more humane, policy of 'Indirect Rule". But on the other hand, Portuguese Africa lacked the brand of paternalistic racism and embryonic apartheid which pervaded British possessions. Intermarriage between Portuguese settlers and Africans had produced a sizeable mulatto population, especially in urban centres. Mulattoes and some blacks were favoured enough to rise high in the colonial administration, academia, or the professions. It should be stressed that this was still only a tiny minority, however, referred to as the assimilado class. Increased white immigration from Portugal put increasing strain on race relations from 1945 onwards, however, and work became increasingly difficult for blacks to find, especially in Luanda where whites were now given preference in all jobs. Luanda's population climbed steadily throughout the 1950s and 1960s, augmented both by white immigration from Portugal, and by continuing black immigration from the hinterland. It was in the mid-1950s, when these pressures were beginning to tell, that the seeds of the national-liberation movement were sown. The Angolan Communist Party was established in 1953, and the Angolan Africans' Party of United Struggle (PLUA) in early 1956. These, plus other left wing organisations and tendencies, united in a single organisation, the MPLA, in December 1956. The new movement drew not only on overtly politicised elements, but also on a strand of cultural nationalism represented by certain literary journals. The individuals who initiated these developments were mostly urban blacks and mulattoes of the assimilado class, radical members of a tiny, privileged elite . The MPLA's early work was mainly concerned with educational and propaganda projects in the shanty-towns, where Luanda's enormous African population lived in the most abject misery. Even at this time police repression was considerable and arrests frequent, but despite this MPLA in these early years was building a grassroots presence among the disaffected mass of urban blacks. The first of the blows which were to shatter this came in 1959. In the neighbouring Belgian Congo, the declaration of independence had been accompanied by rioting in Leopoldville in January, and this sparked off sympathetic riots in Luanda in the following weeks. It is probably the case that MPLA encouraged and participated in these demonstrations, but in any case they were used as an excuse by the authorities to crush the budding cells of militants. Mass arrests took place in March; the Portuguese air-force, plus massive troop reinforcements, arrived in April; more arrests followed in July. Trials were staged throughout 1959 and 1960, which led to long terms of imprisonment and executions. Da Cruz, one of the movement's founders, admitted that MPLA was devastated at this time, "quite unable to transcend its urban origins"(1). Those members who escaped arrest fled Luanda, and took refuge in various places. A number made for the Cabinda enclave, or went eastwards in the countryside, and there they established pockets of resistance which were to last for years. But the movement's intellectual leaders went abroad, to Guinea-Conakry, thousands of miles away. MPLA was effectively impotent, in prison or isolated or in exile. If it continued to exist at all in Luanda after 1960, it was only as a skeleton organisation manned by unnamed militants. For this reason it is difficult to assess what role, if any, the movement played in the risings of February 1961. On February 4th, hundreds of Africans attacked the prison in Luanda, with the intention of freeing the political prisoners. They were unsuccessful, but the attempt was repeated on February 10th. But by this time, the riots had taken on the character of a vicious racial confrontation, Luanda whites interpreting the events as a general rising by the blacks. Consequently, the whites went into the shanty-towns, and set about slaughtering the inhabitants indiscriminately, while the police merely looked on. Over 3,000 were killed on February 5th alone, and the final casualty figures are not known. They clearly run into tens of thousands. The Luanda riots were followed by a rising in the north of Angola, and now the racial tables were turned. White settlers were murdered viciously and indiscriminately. This rising was undoubtedly sponsored by the Union of Angolan Peoples (UPA), a political organisation based on the Bakongo tribe, with nationalist pretensions and a leader called Holden Roberto. Eventually the northern rising was put down by the Portuguese, but it established Roberto as the major figure in Angolan nationalist politics. Meanwhile, the MPLA leaders in far-away Guinea-Conakry were claiming unconvincingly that their organisation had been instrumental in the Luanda rising. This is highly unlikely. To all intents and purposes, MPLA in i961 consisted of a few exiled intellectuals. In October 1961, these exiled leaders moved from Guinea-Conakry to Kinshasa, in order to be closer to Angola, and to implement ;a new policy of building a united front of all anti-imperialist forces. This emphasis on the need for unity had been formally adopted by MPLA at its foundation: its founding manifesto called for a broad front "setting aside all political, social, religious and philosophical opinions" (2). Later, from Conakry, Da Cruz had proclaimed a grandiose intention of negotiating with all other nationalist organisations and building a liberation army on the Algerian model. Now, in Kinshasa, these efforts were continued. In practical terms, the man to win over was Holden Roberto, whose organisation UPA was the most effective nationalist tendency in existence. But Roberto was an unlikely ally: not only was he canny, devious and prone to megalomania, but he was decidedly anti-socialist. The story of MPLA's diplomatic overtures was consequently a sorry one. First, MPLA declared itself willing to make "all necessary concessions" to build a common front: but UPA did not respond. Then MPLA tried to build a common youth organisation: UPA's hostility destroyed it. Gradually rivalry between the two movements grew, until April 1962, when Roberto did form a common front organisation. But in creating the National Front for the Liberation of Angola (FNLA) he pointedly collaborated with several small organisations, deliberately excluding the MPLA. One last attempt at formal alliance was made in August 1962, and its failure forced MPLA onto a new course. By this time, the exiled leaders had been joined by Dr. Agostinho Neto, who had been arrested in 1960 but had escaped from Portugal two years later. His prestige was considerable even during his imprisonment, and from the time he rejoined his colleagues he came to have an increasingly dominant voice in the direction of MPLA. In December 1962, at a National Conference called by the movement, it was Neto who most vigorously advocated a new direction, and an abandonment of diplomatic overtures to Roberto. Instead, MPLA was to concentrate on recruitment and agitation inside Angola itself. Meanwhile, Roberto's continuing hostility was bearing fruit, for President Mobutu, his brother-in-law, expelled MPLA from the country in 1963. The leaders moved just across the Congo river to Brazzaville, but the expulsion did make their new policy rather difficult to implement, as they no longer had direct access to Angola. In fact, even the few armed expeditions or missions which had been dispatched from Zaire had been thwarted and harried, usually by Zairean or FNLA troops. But this chronic problem was lifted from late 1964, when Zambia gamed formal independence, and its new Government allowed MPLA to enter Angola from Zambian territory. Despite considerable difficulties created by the terrain, the Eastern Front was opened from 1966 onwards. By this time, small armed groups had been active in the Cabinda enclave for three years, so the armed struggle was clearly beginning in earnest. The 'new direction' of 1962 was becoming a reality. The process of advance from the east was always the same, and was typical of insurrectionary guerilla warfare, in which the 'political' and the 'military' are combined. 'Political units' would move forwards first, making contact with the population and winning its support, and the 'military units' would follow on. To give some idea of the rate of advance in this type of guerilla warfare: the first armed actions in Moxico and eastern Cuando Cubango were in early 1966, the first action in Lunda in mid-1968, and in Bie in mid-1969 (see map). The distances involved were vast, and MPLA's intention was obviously not to 'occupy' territory, but rather to make it effectively uncontrollable and insecure for the Portuguese. Even so, grandiose slogans were adopted by the movement, such as the 1967 watchword: 'Generalisation of the armed struggle over the entire national territory". By early 1968, however, areas in the east of Angola were considered sufficiently secure to justify MPLA Central Committee moving its headquarters into Angola itself. The majority of the movement's Steering Committee members were now continuously inside the country. And later in the same year, the first CIRs (Centres of Revolutionary Instruction) were established, to provide intensive political education for the fighters, and to ensure their 'correct' orientation. The implication of all this is obvious - central control over the struggle and over the movement were greatly enhanced. This tendency is seen even more clearly in the various organisational changes which were taking place at this time. Since 1964, the day to day coordination of MPLA had been carried out by the Steering Committee, divided into separate political and military commissions. As the armed struggle continued, the value of this separation was increasingly questioned, and in 1968 the two commissions were united into a single Committee. It consisted of 42 people, including all zonal commanders, thus providing a means for regional and local issues to be considered. But it was still criticised as being unwieldy, unable to coordinate a struggle taking place over thousands of square miles. In 1970, a five-man Committee of Political and Military Coordination was set up, chaired by Neto, and major decisions increasingly came to be taken by this tiny body. The process continued as the war advanced, and MPLA penetrated further westwards. In September-October 1971 , both the Steering Committee and the Committee of Political and Military Coordination were enlarged (thus making the former even more unwieldy, and pulling even more power into the hands of the latter, perhaps?). But a year later, this structure was abandoned altogether. A movement for self-criticism and organisational change, the Movement of Readjustment, was launched. Its concrete results on the Eastern Front were to replace both Steering Committee and Committee of Political and Military Coordination with a new "Provisional Commission of Readjustment on the Eastern Front", the Chief of Staff of which was nominated by MPLA Central Committee. Associated with this was the creation of new bodies such as the "Department of Mass Organisation" and "Department of Political Orientation". The Eastern Readjustment was judged to be a success, and a similar movement was launched in the north in 1973. It is hardly necessary to remember the names of all these committees and commissions. The underlying trend is clear enough. Power was being centralised, control over the movement firmly collected into a few hands, and this central core was making sure that it could reproduce its own power. Policy making bodies were set up from the centre, appointed from the centre, and even the "self-criticism" movement was an initiative by the leadership. The question is, why did this process of centralisation occur? Was it inevitable, and was it justified? As was stressed above, although the armed struggle was being carried further westwards, this did not imply actual physical occupation of territory by MPLA; in 1970, the movement had just 5,000 active fighters, so physical occupation would have been impossible. We are talking here not about conventional warfare, which stresses the mobilisation and control of tangible resources, but about guerilla warfare which concentrates upon intangibles, upon establishing generally sympathetic attitudes in the population at large and upon wearing down enemy morale. Given a war of this sort, characterised by mobility, sporadic exchanges and local initiative, the classic military justifications for hierarchy, centralisation and discipline seem somewhat irrelevant. Nevertheless, these justifications were used for the process of centralisation described above. And the man whose personal power was growing most rapidly of all was Agostinho Neto. He had been at the centre of all the organisational changes made previously, all of which enhanced his own power . With the Portuguese coup of April 1974, MPLA's efforts to transform itself into a potential governing party took on a new urgency. In August 1974, the movement's scattered guerilla forces were officially designated FAPLA (Popular Armed Forces for the Liberation of Angola), implying a new discipline and formality. In the same month a Congress was held, which should have been MPLA's First Congress, but various opposition factions within the movement were rather too vocal for the leadership's taste. According to the leadership, ".. .the two factions took advantage of the fact that together they formed a majority to attempt at every instance to scorn MPLA's leadership and with it the whole movement" (3). The Congress was officially "invalidated" as a result, and a subsequent conference of militants was held (it is not clear how these militants were selected). This conference updated the movement's constitution and programme, and elected new central directive bodies: a 35-man Central Committee headed by Neto, and a 10-man Political Bureau headed by Neto. In October a ceasefire was agreed between MPLA and the Portuguese, and in January 1975 MPLA signed the Alvor Agreement with FNLA and UNITA, which entailed the three movements uniting in a joint Government when the Portuguese left on November 11th. But cooperation between the rival movements was no more feasible in 1975 than it had been in 1962, and by July open hostilities were in progress as they battled for power. When the Portuguese officially departed on November 11th, MPLA was in control of Luanda, and it declared itself to be the Government of the new Angolan republic. Meanwhile FNLA/UNITA declared a joint alternative Government in Ambriz and Nova Lisboa. From this time onwards, with the anti-colonial struggle over, civi1 war became increasingly vicious. Rival imperialisms entered the scene, hungry for Angola's oil and mineral deposits. UNITA was backed up in the south by three South African battle groups, who were active in Angola from October 1975 to January 1976. FNLA received aid from Zaire, USA, China and from mercenaries from many countries. MPLA was helped by the USSR and by Cuban troops. As the early months of 1976 wore on, MPLA became increasingly dominant, mainly due to the vast amount of external aid received, reportedly 15,000 Cuban soldiers and $300m. in Russian military equipment. Even so, at the time of writing armed opposition to the MPLA Government continues, mainly in the south where the rump of UNITA's forces are still active. MPLA has exercised power as the Angolan Government since November 1975. We have seen that it became increasingly centralised and elitist in the course of the armed struggle, and this authoritarianism has continued to characterise it as a ruling party. It has set about the 'construction of socialism' with the same military attitudes as it approached armed struggle. A few examples should clarify this. "Only by reconciling the practice of democracy with the subordination of the minority to the majority and by implementing the directives from the higher organs will it be possible to strengthen our organisation. The application of democratic centralism demands the consistent application of militant discipline at all levels, an indispensable basis of our unity", (7). It should be quite clear by now just what sort of movement MPLA is. The question is, Why? (1) John Marcum, 1969, The Angolan revolution (volume one), M.l.T. Press, Cambridge Mass, and London: p. 209. (4) Black Flag, September 1976, p. 3. (6) MPLA for Angola, no. 10 July 1976, Angola Solidarity Committee, London: p. 4. (7) MPLA for Angola, no. 11 August 1976, ASC London: p. 4. The task that now confronts us is to reach some sort of understanding of the development of MPLA. The previous chapter discussed this development, for the most part, as a series of events, but I believe these events can be put into a meaningful pattern by looking at the interplay between the guiding ideology of MPLA, its tactics, and its organisational structure. In other words, I am interested in the internal development of the movement. This is not to deny the existence of external pressures upon it. However, I do intend to demonstrate that it is inadequate to justify authoritarianism and elitism in terms of 'objective circumstances' or 'practical necessity'. MPLA is today authoritarian and elitist because of the basic assumptions which have always underpinned its thought and action. MPLA was founded in December 1956 as a coalition of leftist organisations and tendencies. It was the brainchild of a collection of urban assimilados, mostly intellectuals from a relatively privileged coloured elite, who had often picked up their socialist ideas as a result of studying in Portugal. Their politics were certainly not uniform, but they were able to agree on a form of class-analysis of Angolan society, and upon the need for an anti-imperialist struggle. However, the 1956 Manifesto is still an ambiguous document. On the one hard we have an application to Angolan society of a class-analysis, social divisions and conflicts being portrayed as class issues, not racial issues. The working class is defined as the "spearhead" of the anti-colonial struggle (1). But at the same time, conventional class-analysis seemed inadequate for an understanding of imperialism, with its international ramifications. So another conventional picture, depicting imperialism as a system wherein one 'country' exploits another 'country', was grafted onto the class-analysis. So, having analysed Angolan society in class terms, the Manifesto stands on, its head when it comes to strategy. Class issues are dropped in favour of a populist-nationalist appeal, in which a call is made for "a united front of all the anti-imperialist forces of Angola, regardless of colour, social position, religion or individual political tendencies", (2). What was it to be: socialism or nationalism? The answer was, Both. The contradiction was retained, and stayed with MPLA right through the next twenty years. Perhaps the only way in which it could have been overcome was if the movement had been allowed to develop as a solidly-established grassroots organisation after the 1950s - but the events of 1959-61 prevented this. Thus the socialists of MPLA, following the effective destruction of their organisation in the early 1960s, argued repeatedly for national solidarity and a united front of all anti-imperialist forces, apparently believing that political differences could somehow be postponed' until after the expulsion of the Portuguese. The failure of this 'common front' attempt led to Neto's 'new direction' policy from 1962 onwards. At first sight this latter approach, emphasising the construction of support and solidarity among Angolan peasants and workers, seems to represent an embryonic solution to the socialist-nationalist dilemma. But when seen in context, this interpretation becomes unlikely. The 'new direction' followed hard on the heels of MPLA's rejection by FNLA as an ally in a common front. Thus on the one hand MPLA was claiming to fight a national-liberation struggle, and on the other hand it was tacitly or openly opposed by rival organisations who made the same claim. Its response was to suggest that these rival organisations were not 'real' national-liberation movements at all, but represented sectional or tribal interests; MPLA alone represented all the Angolan people. Having failed to build a common front with its rivals, MPLA claimed to constitute a common front in itself. This is what the 'new direction' was all about. "When we become an independent country there is only one way to follow - the socialist way... today we are just a mass movement, a popular movement, and not yet a real party with the structure of a party. But tomorrow there will be a party with its philosophy, its determined ideology and its structure", (3). The whole strategy, in brief, was based on the assumption that national-liberation (a 'political' question) was separate from, and prior to, the development of socialism (an 'economic' question). The first thing was to capture State power, and the second was to utilise State power and legislate for socialism. From this it followed that the primary necessity was indeed a mass movement, an organised common front. But although MPLA might temporarily pose as an open mass movement, welcoming non-socialist members, it could never be forgotten that it was essentially a socialist organisation, comprising 'politically advanced' elements as well as uneducated recruits. Consequently, even while presenting itself as the legitimate non-sectarian liberation movement in Angola, MPLA was reconstructing itself on an hierarchical basis, cementing its leading cadres in power. We have seen how the Steering Committee lost many of its functions to a tiny, five-man directive committee, and how other organisational changes all tended to lead to centralisation and to put power into the hands of an elite. As early as 1968 the creation of a party structure within MPLA was discussed, but such a task was not undertaken because, in Neto's words, it would have been "premature"(4). It is clear that a party was always envisaged as arising from the mass movement. In the meantime, control was efficiently centred in the hands of the politically-advanced cadres, while ordinary forest fighters received their instruction in the CIRs. There were, of course, external pressures upon the movement, and the 'official' explanation of these centralising tendencies is that they were necessary pragmatic measures, taken in the course of a military campaign. But (and here we are hitting at the heart of current traditional-left mythology) MPLA did not liberate Angola by means of a military campaign. 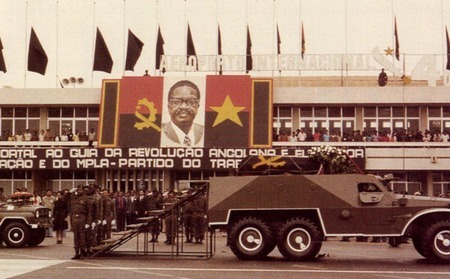 Angola achieved its formal political independence as a result of a whole constellation of events, central to which is the Portuguese coup of April 1974. Certainly, this coup would probably not have occurred had there been no colonial wars in Angola, Guinea-Bissau and Mozambique. These wars wore down the army and encouraged resentment and dissent among soldiers. But this resentment did not come about because the Portuguese were actually losing the wars: rather, it was a frustration born of the knowledge that they could not win them. As in Vietnam, neither side could gain a straight military victory, and as in Vietnam, the outcome of the conflict depended upon morale and political manoeuvrings in the imperialist metropolis, not directly upon events in the colonial battlefield(5). Consequently, it is quite inadequate to justify the centralisation of command within MPLA in purely military terms, for this centralisation was not taking place in a purely military context. The leaders of MPLA were aware of the fact that their war was a war of skirmish and patience, of gradually winning the sympathy and support of the population. Given these conditions, surely a decentralised structure, with the emphasis placed on local autonomy and local initiative, would have been precisely the most relevant form of organisation to adopt. The day-to-day conduct of the fighters must in any case have run very much along these lines - and yet the central leaders continued to construct their committees, commissions, and chains of command. I suggest that the creation of a disciplined hierarchy within the movement was not a response to military exigencies, but rather a logical consequence of the political commitments and concepts of the MPLA leadership. They needed their 'mass movement' if they were to have any hope of riding to power, but mass movements have a tendency to throw up autonomous or 'deviationist' tendencies. Centralisation of power and initiative was a necessary measure by the leadership to prevent this, and to keep the movement on the 'correct' road to national-liberation and socialism. Given their assumptions about the need for the 'national' question to precede the 'socialist' question, this elite-dominated mass movement was a logical necessity. While it would be highly simplistic to characterise the whole plethora of socialist thought in terms of a single opposition, I think we can identify two broad tendencies running through the history of socialism: the State-socialist, emphasising the capture of State-power as a necessary tactic, and characterised by various brands of Marxism, Marxism-Leninism, and revisionism; and the libertarian-socialist and anarchist tendency, emphasising local autonomy, federal modes of coordination, and a refusal to employ State power. In terms of this opposition, MPLA's socialism was very much of the first variety. To some extent of course, this is due to the historical "success" of State-socialism and the historical "failure" of libertarian-socialism, so that the latter does not today present itself as a significant force in the world. We are still living in the shadow of the Bolshevik victory, which is not meant to imply that in fact the Bolsheviks created or led the Russian revolution, but rather that subsequently, they managed to acquire a powerful enough position to suggest that they had created and led it. From then on, their "successful" model of socialism was the one which revolutionaries elsewhere, seeking aid or inspiration, would tend to adopt. But it would be an inadequate and idealist analysis which argued simply that MPLA "chose" the "wrong" ideology. The point is that there were certain quite specific pressures, rooted in the social matrix of colonial Angola, which tended to push any oppositional movement in the direction of elitist State-socialism. To understand fully why this State-socialist perspective was adopted, we must recall the origins of MPLA's founders and leaders. They were mostly urban intellectuals, assimilados, the privileged coloured recipients of a Western education, and as such they were subject to very ambiguous feelings. On the one hand they were close enough to the mass of people to witness their suffering, and to feel loyalty towards them; on the other, they were conscious of being better-educated than the mass of people, felt that they understood better the realities of imperialism and the modern world, and were better acquainted with the material prosperity which Western technology can bring. They consequently felt that they understood what socialism was all about - it was about autonomous economic prosperity. But what was the autonomous political unit to be? In Angolan terms, there seemed to be two levels upon which political action could be focussed - the tribal level, and the level of the nation-State. From the point of view of these Western-educated urban intellectuals, the tribal level was an impossibility, backward and divisive, symbolising all that they wished to reject. The Million State, which already existed embryonically within the framework of the colonial State, seemed the natural, progressive level upon which to move.Thus "freedom" was taken to signify an Angolan State apparatus manned by Angolans, and "socialism" was taken to signify an economy geared to growth and directed by the State apparatus. In the assumptions of State-socialism, and more specifically in the ideology of Marxism-Leninism, MPLA leaders found a body of ideas which chimed in with their own perceptions, perceptions which were related to their class position as relatively- privileged Westernised assimilados. Such ideas seemed to them no more than common sense. To them it was obvious that tribalism was backward and divisive; obvious that the institutions of the State must be utilised by advanced cadres to set Angola on the socialist road; obvious that most Angolans were politically naive and that for their own good they, must be directed and advised by more advanced elements; and obvious that discipline, and an undeviating commitment to correct thought and practice, were necessary for victory. Inasmuch as "national-liberation" is promoted most energetically by people who have had sustained contact with Western culture, values and institutions, It can be seen as the final, most subtle, stage of imperialism. (1) MPLA for Angola, no. 10 July 1976, ASC, London: P.10. (2) Marcum, op. cit., p. 30. (3) Spartacus Monimambu, Liberation Support Movement pamphlet, Richmond Canada, 1968: p. 21-23. (4) Davidson, op. cit. , p. 274. (5) Many observers have stressed the importance of events at the imperialist metropolis. A very good general discussion is by Andrew Mack, "Sharpening the contradictions;, guerilla strategy in imperialist wars", in Race and class, XVII, 2, Autumn 1975. What is the alternative, because if libertarian-socialism and anarchism are to have any credibility they must offer alternatives, though in the form of suggestions, not blueprints. I think the first necessity is to recognise the ethnocentrism, arrogance and latent authoritarianism of 'revolutionary' ideologies built upon a vision of history which is based in the particular historical experiences of certain societies in Western Europe and America. The experiences of societies in the 'Third World' are fundamentally different, not least because they have been progressively underdeveloped (1) by the Western industrial powers for several centuries. There is no reason to suppose that these societies must necessarily follow the development of Western societies, with the institutions of Statehood, bourgeois democracy, and so on. The State-structures which have been imposed on these societies have, almost without exception, become highly centralised, authoritarian and militaristic. The trouble with an evolutionary view of history, positing a sequence of stages through which society 'ought' to move, is that it reduces political action to a series of conditioned reflexes. The MPLA leaders had a dear vision of the 'socialist Angola' they wanted, because they could see its paradigms in the world around them. For them, the liberation struggle was a project with a defined goal, and a clear sequence of events: kick out the Portuguese, form a government, legislate for socialism. The issues discussed in this paper, such as the conceptual separation between national-liberation and socialism and its reflection in a mass movement dominated by a tiny elite, are all consequences of this vision of history. The alternative vision emphasises socialism as the process whereby the masses come creatively to direct their own lives. It is not only a matter of what is done, but also a matter of the way it is done - the two are dialectically interrelated. Centralisation is not therefore a 'pragmatic' measure on the road to socialism, but rather a fundamental betrayal of socialism. It is a betrayal of the ongoing process of popular creativity. Within this process, people will direct their activities in terms of their own particular experiences and perceptions, and it is for this reason that I have stressed the positive significance of tribalism or regionalism in a Third World context. The point should not be over-emphasised, for industrialisation is generating more 'conventional' class-relationships as time goes by. There is no doubt that, for the oppressed millions of the underdeveloped countries, anti-imperialist struggle is a necessity and merits our support. This struggle may well have an armed dimension, though there are other areas of resistance to be explored. (The "glamour" of the "heroic guerilla" is a particularly unpleasant aspect of left mythology, a demonstration of the persistent machismo which plays a significant role in this mythology.) What must be avoided is for these struggles always to be led and defined by urban intellectual elements. Their participation may be crucial, but if they are taking the initiatives all the time, then the struggle will become centralised and elitist, and its ultimate "victory" will herald in a new form of tyranny. Anti-imperialist struggle merits our support. What does not merit our support is "national-liberation" struggle which is based in Western concepts, a Western vision of history, and Western priorities. A true anti-imperialist struggle involves opposition not only to socio-economic and political oppression, but also to the the subtly-related techniques of cultural and ideological oppression. National-liberation movements generally are blind to this, seeking only to replace personnel and programmes, while retaining the imperialists' institutions and values. It is up to revolutionaries to criticise such movements, rather than endorse their confusions and hypocrisies. Meanwhile, the best thing we can be doing to help the oppressed populations of the underdeveloped countries is to work right here, in our own particular niches within the imperialist metropolis, against the exploitative and authoritarian structures which oppress us all. (1) By "underdevelopment" I mean not merely an absence of technological sophistication, but a condition created by progressive and sustained exploitation. Underdevelopment is not an ahistorical prelude to development, but is the result of an historical process, wherein one economy is essentially shaped to meet the requirements of another, more powerful, economy, by which it is exploited and upon which it depends. (2) Marxists traditionally see the proletariat as the only invariably-revolutionary class, while peasants are regarded as unorganised and undisciplined, capable of spontaneous rebellions but never of revolution. This myth is refuted by Shanin in his pamphlet, Workers and peasants in revolution, Spokesman offprint no. 6, 1973. There are more forms of revolutionary consciousness than are dreamed of in Marx's philosophy. OCR'd 2007. My apologies for any errors. The original was printed using pale green text on a white background. The map – printed using black ink on a dark brown background was impossible to scan properly. Angola Solidarity Committee, MPLA for Angola, no. 10 July 1976, no. 11 August 1976, London. Angola Solidarity Committee, Angola, revised edition October 1975, London. Black Flag, September 1976. Alfredo Bonnano, Anarchism and national liberation struggle, Bratach Dubh, Port Glasgow, 1976. Alex Callinicos, "Angola: a new Congo? ", in International Socialism 83, 1975. Basil Davidson, In the eye of the storm, Penguin, Harmondsworth, 1975. Guardian, 12/11/75, 4/2/77. Institute of Race Relations, Angola: a symposium, Oxford University Press, London, 1962. Liberation Support Movement, Spartacus Monimambu, Richmond, Canada, 1968. Liberation Support Movement, Road to liberation, Richmond, Canada, 1976. Andrew Mack, "Sharpening the contradictions: guerilla strategy in imperialist wars", in Race and class, XVII, 2, Autumn 1975. John Marcum, The Angolan revolution (vol. one), M.I.T. Press, Cambridge Mass, and London, 1969. Nigel Young, On war national liberation and the state, Peace News pamphlet, London, 1970. As someone with an interest in Angolan history ever since reading Another Day of Life I found this very interesting, thank you.